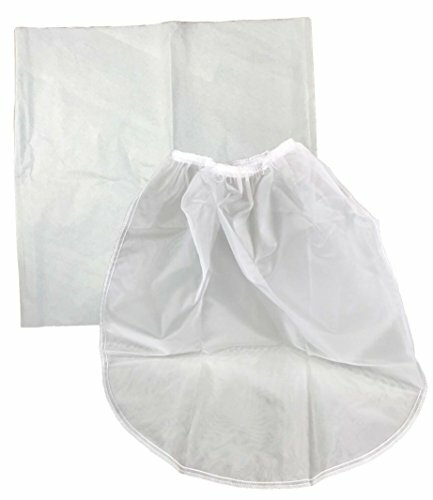 TOP BENEFITS OF COFFEE FILTER BAGS · EXTREMELY DURABLE · INCREDIBLY SIMPLE TO USE · PREMIUM FILTRATION GREAT FOR COMMERCIAL TODDY COLD BREW SYSTEM COFFEE SYSTEM These paper filter bags comes with a lifetime 100% guarantee, fits Toddy Cold Brew System commercial brewers. By purchasing these bags in bulk you never need to worry about running out again. DON'T WASTE YOUR MONEY ON CHEAP KNOCKOFFS Please note the following important information about this product from Think Crucial: (i) it is a generic replacement, NOT a TODDY Cold Brew System Original Equipment Manufacturer (OEM) product; (ii) because it is not a TODDY Cold Brew System OEM product, it is not covered by any Toddy, LLC guarantee or warranty; (iii) use of this generic replacement may violate or void TODDY, LLC's guarantee or warranty - it is entirely your responsibility to check, and entirely your risk if you decide to use this product; (iv) we do not guarantee or warrant that this generic replacement is compatible with any product from Toddy, LLC or any other provider. Please check your manufacturer's warranty with regard to the use of non-OEM parts. Think Crucial provides no warranty or guarantee with regard to the product or its compatibility with your TODDY Cold Brew System product. The TODDY brand and all TODDY trademarks belong to Toddy, LLC or its affiliates, and are used here only to explain the compatibility features of the generic replacement product. Toddy is a registered trademark of Toddy, LLC, which is not affiliated with Think Crucial. Toddy, LLC does not endorse this product. ✅ EXTREMELY DURABLE so you can use your coffee paper filter bags & strainer and your strainer together without the fear of your bags breaking! ✅ EASY TO CLEAN! With these coffee filter bags & strainer it will make cleaning your Toddy Cold Brew System 5 Gallon unit a breeze! ✅ INCREDIBLY SIMPLE TO USE because there is basically only one step! Use this for any Toddy Cold Brew System commercial brewer and you're good to go! ✅ PREMIUM FILTRATION so you don't get that weird taste and you let the essential coffee oils and flavors through to your Toddy commercial brewer!